Earlier today fishermen and residents of Mosquito Creek noticed schools of fish floating on the water. While reports as to what exactly caused today’s occurrence, Fishermen and Friends of the Sea (FFOS) Corporate Secretary, Garry Aboud in an interview with News Power Now gave details regarding what he says is an ongoing issue in South Trinidad. Aboud who visited the area today stated that approximately 20,000 dead fish had washed ashore with maybe five times more are at the bottom of the sea. He said that while it is generally the position of FFOS to defend fishermen, in this instance they area calling for fishing in these waters to be stopped as it poses a major health risks to persons who may consume fish from the area. Meanwhile, News Power Now understands that thousands of dead herrin, mullet and catfish have been washing up along the shoreline of the Mosquito Creek over the past few days. 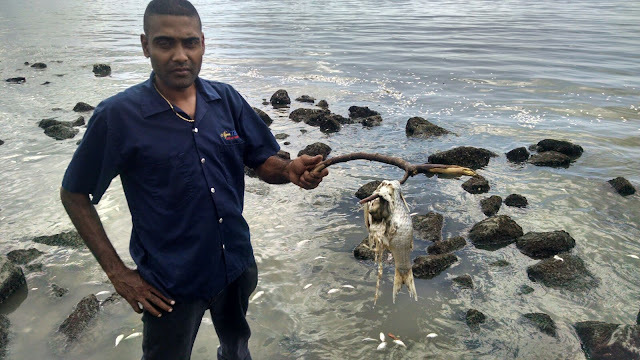 The dead fishes started coming to shore late on Monday afternoon and President of the Debe to Penal Action Committee Edward Moody is now calling on the Institute of Marine Affairs to investigate the cause of the deaths.